First off, congratulations to all those who competed in Godzone. Can't wait to hear some of the behind the scenes stories! Next up...I think...is Expedition India. I'm flying out on Monday night to meet teammates Mark Lattanzi, Jen VanGorder and Ryan VanGorder for a romp through the Himalayas. Well, the foothills...though they are some mighty tall foothills! 3 bike legs, 3 rafting legs, and two treks. Two of the rafting legs are guided and dark zoned. They expect teams to make it through one of those legs but not the other. The third leg is self guided. For both the biking and trekking legs, we have been told to "Prepare yourself with massive altitude gains and losses". Right, Himalayas. And it sounds like one of them will be high up and with plenty of snow. We've also been told be prepared for some wacky weather and likely some COLD weather. That said, in the valleys it likely will feel rather warm for those of us coming out of winter. "Navigating in an area with numerous villages is different. Paths that connect villages and are used for daily living is not on the map. Path scouting and the ability to travel in a general direction by using different path networks will be vital. Trekking routes are not marked. " After a long flight, we then board a bus for a 14 hour trip to the start location in Manali. It sounds like we may be getting off the bus and walking into amazingly colorful festival of Holi. Last time I checked, 26 teams signed up with some very impressive names: Estonia, Naturex, Painted Wolf, Agde Raid, an international all-star Bend Racing team plus several other strong teams, especially from Europe. From what I know of the 2017 edition, they have many more local teams signed up this year which bodes well for the growth of the event and the sport in India. Can't wait to see the chatter in the aftermath of the event! Look forward to dot watching! Also, I left Thunderbolt from Down Under out...one of the top teams in the country. So add them to the list of top notch teams. So, I'd say 6 elite level teams, and the rest of the international teams are all really experienced good teams. And you never know how locals might shake it up. I agree, Stijn, excluding the ridiculous deep Kiwi field at Godzone (once again, several top ten teams I've never heard of that really are talented and fast) and I suspect the field at Eco, this might be the strongest field top end of the year. Maybe Africa in September is similar (ironically...or not...both Africa and India are run by the same RDs...). It’ll be exciting to watch you, Broots. Have a fun trip and a great race! Holi is a Hindu spring festival, originating from the Indian subcontinent, celebrated predominantly in India and Nepal, but has also spread to other areas of Asia and parts of the Western world through the diaspora from the Indian subcontinent, also known as the "festival of colours" or the "festival of love". The festival signifies the victory of good over evil, the arrival of spring, end of winter, and for many a festive day to meet others, play and laugh, forget and forgive, and repair broken relationships. It is also celebrated as a thanksgiving for a good harvest. HOLI HELL we are excited to watch this one play out! GO ROOTSTOCK!!! I hadn't seen the bit about cannabis laced drinks...I'm laughing out loud imagining 100 adventure racers pounding some bhang after 3 days of travel prior to 5-6 days of racing...such an image...I'll be sticking to bottled water but very open to disguising myself as a rainbow! Lol! You probably know that you should treat the bottled water unless you are very, very sure about it. Can't wait to dotwatch, theorize, ruminate, and learn more about Northern India than I ever thought I would. Travel safe and race fast! Painted Wolf had to drop due to a literal last minute accident of some sort. Such a bummer. They would have been a top contender to win. I was looking forward to seeing them in action. Hope all is ok! Just heard from broots that race start is Saturday morning local time. They’re 9.5 (who knew there were half time zones??) hours ahead of us here on the east coast of the US. Thanks! We have a half hour time zone in Canada: Newfoundland. 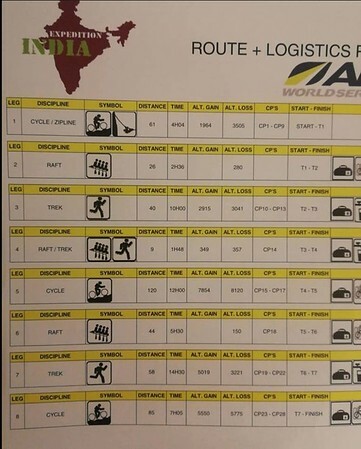 Got word from broots that teams boarded the bus in Delhi and should now be en route to Manali for the start of the race. A fourteen-hour, overnight ride. Bash, interesting! I’d never heard of that before. there's nothing like free wifi at an int'l race!! screw the toilets! broots said that the whole trip took 20 hours (including the stop at the bus company). No big deal - just 8,000 m of climbing and another 8,000 m of descending in a 120 km bike ride with three CPs. And there are 7 other stages. :) Have fun, Broots! Yes and the time for that bike ride is only 12 hours.... All the times look fast to me if the distance and climb are correct. Talked to broots a couple hours ago. It sounds like the general consensus is that the elevation is in feet, not meters. He's also expecting the start to be right around 10,000 feet. Apparently there was a landslide on the road that they'll be riding down, which could affect how far up they'll be able to drive in the morning. SM article on the eve of the race. As Abiperk says, the organizers are saying they’ve provided meters of elevation gain but experienced navigators think it looks like feet. Their race overview map has no contours “for security reasons”. 1. There is a dark zone before leg 6 rafting. The clock won't stop there, so lots of strategy on where and when to sleep. 2. Sounds like most CPs are on trails, but that there are a ton of unmapped roads and trails. He expects some fun and tricky nav. 3. He said that if the weather during the race is what they had today, the conditions will be ideal. Manali is forecasted to have rain/snow over the weekend, but it's not clear how far that extends into the course. Sadly I think that's probably the last of it! This whole meters versus feet thing is bizzaro...if Kinetic is right, it means their time estimate is really funky. And if they're wrong, then it's weird they're doubling down on it so hard. It gives me a little pause about their race directing - that's a pretty big discrepancy that racers will have to plan for! Heading out for the day so will be relying more on facebook than maps. It sounds like the river is moving more quickly than organizers expected. Most teams are off the water and onto the first trek. I know Rootstock is planning to go through night one and likely catch some sleep somewhere during the big bike (leg 5). Video up from TA2 on the Rootstock Facebook page. Sounds like they’ve had a rough start. Hoping they find their groove on the trek! Second paddle was canceled due to blasting/rock fall. Teams are trekking around to their bikes, using any route they choose. Loving Rootstock's nav...caught them up with a bunch of teams. Does anyone know if the dark zone after the big bike is on or off the clock? Clock doesn't stop at the dark zone. I know Rootstock's plan is to sleep on the bike leg somewhere, to avoid tent city in the TA. When I talked to broots, they weren't sure whether they would find a hotel or carry gear because they hadn't seen the maps. Not a good time for Naturex's dot to stop updating! Looks like it'll be super close for them to get to CP18 before the dark zone hits. Looks like it took them about 2.5 hours to get to the halfway point, but the water looked relatively calm at the put-in. 5:40pm right now. Seems impossible that they'll make it all the way to the CP before the dark zone goes into effect at 6:30pm. “Front teams are arriving at T5 after the long MTB leg and making a quick transition to get paddling on the water before the 18:30 dark zone. Teams are not allowed to paddle or walk along river after 18:30 and must camp on the side of the river until 06:00 when the dark zone lifts. Lead team Naturex is camping along the river on the Leg 6 Rafting stage. They didn't reach CP18 in time. Agde Raid is sleeping at the T5 River Camp in 2nd place. The Estonians have just arrived in 3rd place. The clock doesn't stop here. Actually, Bend Racing is also at T5. It looks like they arrived around the same time as the Estonians - maybe even earlier - so we'll have to wait for the leaderboard to update. Since the clock doesn't stop, it doesn't matter much who is in 3rd or 4th! Zooming WAY in, Agde is not with the other two teams. Maybe they found accommodation or a quieter place to camp. Estonians beat Bend Racing in to T5 by 2 minutes. Very impressive performance so far by the Nepali Army team. Excited to see if they can keep it up. Looks like the Nepali Army is in 5th? I can't tell if there's another dot hiding behind them but I can see the locations of the likely suspects so probably not. Does anyone know whether the tracker stops updating if teams are sleeping? Wondering if Rootstock may be catching a few hours at JM Harison's Hotel. Latest SM article with some info on top 10 teams. Sounds like T5 is pretty nice for camping! The other clue is the time/distance between dots in Rootstock's track as they approached the hotel. The final two dots showing on their track now are very close together compared to previous dots - 2 minutes and only 100 m apart (averaging 3 kph) - and the last dot is right in front of the hotel. And it was right when the dark zone kicked in so they weren't wasting daylight by stopping. Yeah, I saw that, too. Hopefully they're getting good sleep! "Just checked the user manual. If a SPOT Gen3 device doesn't sense any motion for 5 minutes, it will send one final track of the "resting location", then go to sleep until it senses vibration again. It's a battery-saving feature. but not one that I would want in my personal tracker!" Just catching up after being offline most of yesterday. I love Rob Howard's description of the start! "It was a ride unlike any they’d made before because they had to make a way back down through the landslips, riding through debris and avoiding boulders. They were avoiding everything else too, mules, pedestrians and the manic traffic which was all but gridlocked in town, a stationary mass of honking metal. Vehicles were so tightly packed that it was all but impossible to squeeze through with a bike, but after reaching CP4 back at the Anant Maya Hotel the route left town and the gridlock behind. Part of the team instruction is to ‘follow the rules of the road in India’ ... but I’m sure none of the racers have yet figured out what they are!" Endurance Aromon and Nepali Army have arrived 5th and 6th at T5 one minute apart. Issy Adventure will roll in any minute now in 7th place. Not surprising given their reputation, but an impressive showing by the RDs in their time estimates. Despite all of the pre-race chatter about the massive elevation profile of this leg, the top five teams have all completed it 10-14 hours, a pretty close margin to the projected 12 hours. Curious to see how long it takes the rest of the field (sleep time notwithstanding). It's a good distance back to 8th place Vaucluse, still riding in the dark. The teams that have passed Rootstock during their rest stop include 9th place Abvimas Manali (still riding), 10th place Thunderbolt (seems to have stopped at a hotel) and 11th place Himalayan Baby Wolf (still riding). It looks like Rootstock has been stopped for 4.5 hours. It looks like other teams took 6-7 hours to get to T5 from their nice hotel. It's 6.5 hours until the dark zone lifts so maybe we'll see that well-rested SPOT Gen3 start vibrating soon! From your fingertips to their ears, Bash! They're on the move! I'm betting they got four hours, based on recent conversations on sleep strategy/philosophy. Is Rootstock hike-a-biking on the edge of a cliff? 3:30 a.m. in India...do you know where your husband is? I think they'll make it into the TA in time to get on the water with the other teams. This will be an exciting restart. Lots of race left still, and Rootstock is really well positioned in terms of sleep. They lost a fair bit of time to Thunderbolt on that little cliffside jaunt, but it looks like they're back on course now and hopefully with pick up speed again. Rootstock is 75 minutes behind Thunderbolt but it's still almost an hour until the dark zone lifts so they'll likely catch up. Did anyone see how long Thunderbolt slept? I can't see dots going back that long - which isn't that long, really. This tracking system needs longer tracks! I think they were stopped for roughly 2.5 hours. Bash, if you go to the upper left corner of the page, just above where it says "show track," there's a dropdown for the various race segments. You should be able to see the full tracking there. Ah, thanks for that tip. I was frustrated not being able to see the sections I missed. It took me awhile to figure it out yesterday! News out that leg 6 rafting is delayed - no reason given yet. is this paddle guided? on the dark zone, do the guided sleep w the teams too? It is guided, yep - I wondered that, too! Naturex was the only team caught out. They're moving now, so clearly didn't get word of the delay. Does anyone have any idea why 2nd place Agde is rafting on Leg 6 but no other teams have left T5? They're missing some dots but based on their position, it looks like they've been on the water for a couple of hours, i.e. since the time the restart was *supposed* to happen. I'm wondering the same thing. They stopped tracking for awhile (45 min?) but are back up and moving again. Also, seems strange not to have any info on the reason for the delay, after relatively good coverage for 48 hours. Hoping it's just weather or conditions on the water. Given that two teams are on the water, I'd like to think the delay is not for river safety reasons. Given our experience with a porter strike in nearby Nepal, I'm wondering if a situation has arisen with the guides. Interesting! I've come up with all sorts of scenarios in my head, but a porter strike wasn't one of them. The 120km Cycle is tough. Endless climbing, fast technical downhills and switchbacks fri ged by natural forests. It was a tough day for most teams on this leg and they really had to dig deep - but the views and unique villages will be in their memories for many years. The fact that nothing has been posted is one of the things that makes me wonder about staffing issues. It might not be a strike exactly, but when Westerners urgently need a service, there is the potential for negotiation. Or sometimes schedules are flexible. You know how with Island Time thing happen when they happen. Well, today it looks like we're running on India Time. My understanding is that the Boats were late arriving but are now inflated and due to leave soon." Still here (working on taxes). Sleepmonsters Facebook has posted photos of teams waiting to paddle, rafts being inflated, etc. More photos available on FB than I can embed here. Naturex is at T6: Tattapani Hotel Hot Spring. Teams are on the water now, released at 1-minute intervals. Rootstock was interviewed. Oh, and Thunderbolt said they got 2 hours of sleep. Teams will be time credited for the extra delay. Something funky with Estonia's tracker. I'm assuming they did not ditch their boat on the water and start the trek! "According to the latest information, ACE 15 min will be fined in connection with the fact that he did not bring the boat to a dangerous place The was hit by the stomach virus tonight, but we hope that the medical services given by the organisers will help, this is also due to the slow For the information of the in team, there are also two members of the stomach virus on his team, and because of that, they are now rested, they hope to be able to move again soon." That explains everything. ?? :) There is a 2.5 hour gap between their last two dots on the river, not far from T6, then their track turns around and follows the other side of the river. I was guessing that the final dot on the water was just a GPS anomaly. It sounds like there’s more going on! Once again, it appears that Rootstock didn’t get the most skilled rafting guide. Although teams started from T5 one minute apart, there was a large spread by the time they reached T6. It also looks like Rootstock rested for a couple of hours at T6. Naturex taking a more southerly route to TA7 than the green line on tracking map. Will be interesting to see if they take a road up to the TA or bushwhack 400m at the last minute (if it's even possible). I also like on this tracking map how you can see locations for the RDs and media! AGDE RAID hasn't pinged in over an hour, while others are pinging regularly. It looks like they are standing still as the pack closes but I bet that are much closer to the summit than it is showing. Looks like the valley up to CP22 is a dead spot for the trackers. The other teams that have started to climb through the valley have stopped sending pings as well. It will be a surprise as the teams hit the summit. Bend’s location hasn’t update in hours. Any update on their location? Clarified on FB: The Estonians “ran a dangerous rapid”, hence the penalty. I'm thinking Bend must be still in a hotel trying to bring Lars and Isla back to life! AGDE just pinged one ping past Naturex's "decision point" on the trek, where Naturex deviated south of the RD's line. looks like AGDE is going on the RD's line. best as i can tell, it took Naturex 5 hours from the decision point to reach TA7. interesting to see what everyone else does! The person running their FB page speculated that they may have missed CP21. Estonia's back on track (as is Rootstock, after a brief S/SW detour away from CP 21). Thunderbolt hasn't tracked in three hours and seem to be stopped in a town, so I'd assume they're sleeping. Yikes! Naturex took a wrong turn on the final bike and appear to be heading away from the finish line... and Rootstock seems to have backtracked past CP21??? Okay, Naturex has righted themselves. Rootstock has yet to ping again. "Teams can go down road a few km to connect to lower road, and then loop back, or just go through town and connect by pushing bikes a bit and then connect with that lower road. Very tricky at night with a * busy" Indian map"
Posted just now: "Bend Racing are still resting and recovering at TA6 from Illness. They are hoping to continue and will decide soon when they head out." Silky, here's our answer, from Sleepmonsters: “We really thought we could beat the cut off for the dark zone, but didn’t make it and had to camp. We found a nice beach and built a fire so it was comfortable. Our guide didn’t know he might have to camp out but had to stay with us! We didn’t have much to share as our bag of camping gear wasn’t at the start of the paddle so he stayed close to the fire all night." The final bike leg took Naturex 8.5 hours including transition time at T7. 2nd place Agde is the only team on the final bike leg at the moment. 3rd place Endurance Aromon (Spain) is approaching T7. Looks like Abvimas is turning around on the trek. Maybe a chance for Rootstock to pass? Yes! Rootstock has moved into 6th on the trek. Nice work! The Estonians have started tracking again. They're solidly in 4th ahead of Issy although it looks like they might be wandering west of Deora Temple right now. Hard to know without the maps. They're not far from the green line. Looks like the Estonians were just marching to the beat of their own drummer. I wasn't online much today so I don't know if other top teams made creative route choices on this trek too. Issy is right on the green line behind them in 5th. Agde has one more CP to pick up before finishing 2nd. Endurance Aromon is biking now too. Rootstock has just arrived at CP22, the temple on the summit, in 6th place. Abvimas is close behind them but they have a good gap on other teams they've passed. Go, go, go! Most teams yesterday followed the geeen line or close to it. Naturex bisected it as Rootstock is doing but ended up one road to the east (Rte 5). Curious to see what brent does with the last few kilometers. Woohoo! Go Rootstock. Looks like they're headed over to Rte. 5 now. Rootstock is in TA in sixth place! The top three teams took 7 to 8.5 hours for the final bike leg including TA time. Rootstock will do almost all of the ride in the dark. It looks like they napped before the trek, which took more than 24 hours, so I wonder if they’ll feel OK to leave quickly and push through the night. They seem to have avoided Delhi belly - phew! Wonder if they'll leave TA before the next two teams arrive. Both Thunderbolt and especially Abvimus Manali Mountaineering look like they are closing in fast. What's going on with Rootstock's track? They seem to have left the TA not on the orange track. A mistake or a clever alternate route? Or an errant tracker? Dot watching is nerve wracking! Looks like Rootstock is opting to stay high on the ridge and take road "5". It will intersect the RD's route. Could be a good choice, it will be interesting to see how it plays out. I don't think it will be enough for them to catch 4th or 5th but we will see. I wish we had maps! It could be a great route choice depending on what happens next on the way to CP23. I'm with you about the maps for sure. I've been trying to plot a possible route but everything I see involves at least some time not on a road. Maybe turn off at Lafu Ghati Hotel to Ajay Orchard? Looks like they’ve just turned there if the GPS is right. The interesting question is whether there will be a direct trail from Cafe Haat to CP23. Meanwhile, Abvimas has left the TA heading east of the red line. Bash is there a way to see the CPs on the live track? I have the descriptions from the racer guide but knowing CP 23 is a "Bridge" doesn't do much good without the maps. I can see the TAs but not the intermediate CPs. Where is the racer guide? Yes, you can click on the little bicycle icons on the tracking map to see photos of the CPs at their locations. The rest of this article provides updates on teams further back including Bend Racing. Lars had to drop out due to illness. Rootstock has pinged again and is heading east now. Looking good! Sleep Monsters posted the racer pack on a google drive. Thanks! Looks like Abvimas didn’t leave T7 yet. It’s probably not marked quite accurately on the tracking map. And Thunderbolt has just arrived! Rootstock has passed CP23. Unfortunately, it looks like they lost time taking the western route. But no other teams have left T7 yet so they're about an hour ahead of the chase pack. Thunderbolt would have seen Rootstock coming the other way on Route 5 as they finished their trek. They headed out the same way on the final bike leg. They're just at the point where they should turn east. From Rootstock's current position, it took Naturex 6 hours to reach the finish. They were the slowest of the top 3 teams but the only ones to do most of the ride in the dark. The Estonians are finished in 4th. 5th place Issy has taken a wrong turn in the dark and is heading away from CP27. And they've turned back already. "The SPOT Africa GEN 3 Tracker is a GPS Tracker that allows the Race Director to track position and assist in an emergency. Team Kolkata Police (20) flipped the raft on a large rapid resulting in all members ending up in the water and the boat floating downriver. At 10:12am local time they pushed the SPOT Help button and in seconds a notification was sent to Race Director Stephan Muller. A rescue vehicle was immediately dispatched from T5 and was with the team at 10:48am. The team is all safe but a little shaken after the incident. Currently they are being transported back to T5 and from there be transferred to T6 for the trek." A little delayed but still fun to see what the race course looks like - the Day 2 video summary. Abvimas has stopped in a town to the northeast of T7. They're either *way* off course or they have dropped from the race. Whoops, little correction by Rootstock at the turn near the Electrical Substation! Looks like Issy did the same thing there. 7th place Thunderbolt is just rejoining the red line route on the way to CP23. They will be closely chased by Vaucluse (8th) and Nepali Army (9th), both of whom took the faster red line route. Rootstock has gone back to the Electrical Substation. Noooo!!! Maybe they're getting some food? And they've returned to the red line route - phew! Whatever happened there (maybe they did get food? ), it has allowed Thunderbolt to gain time - just 35 minutes behind Rootstock now. i thought maybe there was a better route thru the Giri Ganga Water Pump House but looks like what I consider to be private property, not sure how that works in India! It would have been a similar type of route choice to their CP23 route. It looked like there might be a climb on minor roads/trails to CP25. It will be interesting to hear what actually happened there. Issy has finished in 5th place. That last section goes fast! Thunderbolt has been heading east for half an hour - but they're supposed to be heading west. So Rootstock should be spared a sprint finish. Looks like thunderbolt has turned around. Both teams are making this last bike interesting! The Nepali Army has also turned around at a time when they could have been gaining on Thunderbolt. Vaucluse just met them. Neither team has made it to CP23 yet so Thunderbolt won't lose their 7th place position on the course. Thunderbolt wasted no time once they'd discovered their error. They lost 45 minutes and are still in 7th. Maybe 75 minutes behind Rootstock? It took Issy about 5 hrs 15 minutes to the finish from Rootstock's current position, also in the dark and with a small error. Both teams are off course!! Who will correct first???? RR seems committed to the "creative" route, now turning northbound, STOP IT!! I thought there might be a creative way to the CP via the Lucky Homestay road but their last dot is not what we wanted to see. Vaucluse and the Nepali Army are riding together in 8th and 9th, heading for the Electrical Substation. Time to make that creative route choice (if it was a choice?) work for you, Rootstock! ok they seem committed. fingers crossed for a creative route with out-and-back to get CP26!! They still need to visit CP26. Thunderbolt has just picked up CP25 and is less than 20 minutes from the place where Rootstock left the red line route. Rootstock is heading in the right direction for the "creative route choice", whether or not it was actually a choice! Is there a map showing CP’s? We don't have the race maps but if you click on the little bicycle icons, they are the CPs. Thunderbolt made the hairpin turn and is following the red line route. Their last dot was headed the right direction. At this stage, I'm afraid they're going to have a "sprint" finish with Thunderbolt after all. Yep, looks like they found a track to the road now. Lets see if they can beat Thunderbolt to 26. It took Naturex about an hour to get to CP26 from Thunderbolt's current position. It looks closer than that but it's a climb. Rootstock is on the road. They still have to climb from 1950 m to 2300 m to get CP26. Allez, allez, allez! Nepali Army just turned toward the Electrical Substation. Must be the Him Sutra hotel that keeps attracting the teams down that way. They're back on track along with Vaucluse. Fortunately, I think Rootstock is out of range for them. It is stressful watching Rootstock and Thunderbolt race toward one another! The map in that area must not be very clear. And it must be hard to figure out where they are at night. Thunderbolt has passed CP26. Rootstock should meet them head on in a little while. Nepali Army and Vaucluse are at CP25 now. Unbelievably, Rootstock and Thunderbolt have missed each other on the road past CP26! Thunderbolt will assume they are well back of Rootstock. The teams are less than 1 km apart and they have no idea. I wonder if there are people at CP26 who might tell the teams their positions and timing. Probably not. It's beside a lodge but the CP is the road junction. Rootstock should be at CP26 now. Heads back in the game to the finish! Yes! They're 40-45 minutes behind Thunderbolt now. But Thunderbolt has made a couple of sleepy errors on this leg already. The race isn't over. Thuderbolt now appears to be the ones taking an alternate route choice. Some other teams have taken that route. For some reason, the route that looks short and obvious on our map doesn't look like the best choice in the real world. Wow, this has been an exciting final two legs. Thanks for keeping the updates coming and Go RS! We need broots to post pictures of the maps when he gets back! Ditto jbrown! Loving the updates. Thunderbolt has finished in 6th place. Rootstock will be arriving in 7th place in a little while. It was an exciting race, and Rootstock never stopped pushing. Their strategy - nav, sleep, etc. - looked pretty solid from afar. Every team had some nav bobbles, including Thunderbolt on the final ride. Rootstock can be very proud of their top 10 finish on a tough course! P.S. Feet or meters, Broots? Congrats RS! Glad to see the crew moving down the final stretch to the line. Great work again on the last trek to leapfrog several teams. RS is across the line! Congratulations to all the teams. It's been exciting watching from afar! Well done! :) Now get some sleep. From Bend Racing Facebook: "Just got the word the the team is out of Expedition India. They activated their SPOT "help" function late last night high in the mountains. They are all ok, but obviously not ok. Will keep informed if possible." ‘The Bend Racing team had to withdraw from Expedition India but are now all at the finish hotel and feeling better. SM: The 8th place Nepali Army says they would train next time, now that they know what’s involved. They are athletes in other sports - a triathlete, a rafter and two mountain bikers. Broots with the glamor shot! OK Broots, you've slept long enough. Your Attackpoint fans are awaiting your arrival! Luckily, Broots has been known to jot down a few lines for a race report so we will eventually get to enjoy the full story. 1. He said the race was spectacular in terms of the course, the organization, the media, the other teams, everything. 2. He said that they saw very little undeveloped land. There were walking paths EVERYWHERE, and the navigational challenges were working their way through them. 3. Because of #2, he said that he’s never experienced local culture in a race the way they experienced it here. 4. He said that he views this race in a similar vein to ExpAK. He doesn’t expect it to run again, and he feels incredibly lucky to have gotten to be a part of it. Wow, can’t wait to read the report! I can’t stop thinking about them! Hi all! As always, thanks for following and for the support. Working on packing and needing to go find a gift or two for a certain five year old, but some initial thoughts. A full race report will follow, and I have a feeling it will put my longest ramblings to shame, so get ready. I also took a TON of video, and when time allows I’ll splice it together. Ok, first this was the most amazing race experience I’ve had, hands down. The Kinetic team is incredible and we could not believe what they were able to do with a small staff in a country where logistics are often near impossible and considering that they had to rely on locals who just don’t operate by the standards a race like this requires. The RDS and their team are simply the best. The maps were unlike anything I’ve seen. An overwhelming amount of information on 1:50000 scale AND then twice as much (or more) going on on the ground that you had to balance. Overall, I think we handled it well, but we fell victim to it on that last bike, finally. Bad time for it, but so it goes! FYI: we were never bikewhacking, I actually had a good and correct handle on our location (a network of unmapped village roads), but we just couldn’t put it altogether with a decisive move...until we finally did. I’ve never done a race with so much nav. Nonstop engagement and often very tough. Hoping they can give us a little piece of that at EA Rodrigues in Sept.
Not sure what I'm more eagerly anticipating... GoT season 8 or Broots follow up report! For those on Facebook, check out the amazing party photos - currently happening! And here is the report, history, adventure in nothing like the others we have lived on this expedition India 2019. A raid with multiple surprises until the middle of the night of the last section... to read until the end !!! The organization is in difficulty on this departure, it had planned to make us go close to the rohtang pass, but the snow hunts did not go as planned and the snow in too large quantity prevents them from making the departure in this grandiose setting, door Ladakh and high peaks. We're going on the road around 2500 m altitude a few kilometers north of manali in Indian queue! We are going quickly well decided to reach the zip line in order to not waste time in sight of... pass before the dark zone of Sunday night! We have a very precise 15000th card for the occasion and I find myself to guide as in vt' o to the attack. Traffic on the road is "Indian". truck, cows, bus, on the left, on the right, landslides, stoned roads, corks, bridge against meaning... we slalom downhill, it's hot and we're going to Surprised to find this pretty nice especially sandrine. We're working on the beacons at the beginning with the young Spanish and the friends of agde then alone. We're going fast, very fast. And we arrive pretty quickly at the giant zip line or only romu and I go through the valley of 300 m in return for a flight to sensations. And here we go again for a part more mtb and nature, we go too fast for the organization that does not have time to put the beacons and we reach the ta1 before the mtb crates and the raft equipment of the following section. Free 25 mn rest where we take time to feed and chat with AGDE ONLY 5 MN behind us. Other Australian and Spanish American favourites are coming later. A sign? We embark at the same time as agde with a local guide on the beas river. Beautiful Fast Class 3 chain up and we take a lot of fun. We are doubling many indian rafts with local tourists who are just being transported like in a gondola. The atmosphere is casual even if we lack a little bit of tie on a big rock. We are at the front with Tom and we take beautiful waves that seize us because the water is cold. Dirty too, the wastewater is pouring into it, the sorting are strewn with the bottom. We are not on the ganges but it looks like it. Cremations, poor children in the garbage, houses in decompositions, camps, slums by the river. This is a real cultural shock. This route in India allows us to explore all the facets of this country without anything hiding us, so much better... we finish this 2th memorable section always in mind but the pack close to our kits. After a quick transition where we postpone the beacons on our new cards in the 50000th, we are committed to this section walking and eating then in trail mode well decided to enjoy the last hours of the day to climb as high as possible and Observing the reliefs. We're going fast, the beginning is going well, we lose 15 minutes to find a passage to join the "path" indicated on the map. We're off to a small hour in order to join the splendid snowy ridge at 2500 m altitude at the time of the sunset. Privileged moment for us that the raid adventure offers us so often! Snow, pasture areas, small isolated farms. We continue on the ridge for a while. Frontal appear behind us not so far. We then choose to leave this snowy ridge to go down through map trails in a valley to then go back directly to the cp12. alas after a quick start, the trails close and we meet off trace in steep and difficult slopes. We even fall in an insurmountable canyon. We're getting out of it but we don't waste a lot of time. Too bad. Our lift is easier because the trail is more obvious. Our rhythm is always good, romu runs a little less well. We're getting a little closer to the cp parashar lake. A splendid temple on the edge of a lake. Amazing and unique place as evidenced by the photos taken of the day. We find 15 minutes later the friends of agde who doubled us by staying on the ridge. Naturally we are committed to the last part of this section together. I'm less lucid and the map seems to me somewhat illegible in its details of reliefs. I think I'm going to the feeling and the compass, full south. But Polo seems to him to contrario very in confidence. We go from small trails to small off-traces cuts. Our direction goes away too much is compared to the south necessary. At the end of 2 PM, we even find ourselves down along a north-East River. We can finally get back on the map and we'll see that we're going to have to make a great tour that we hope very common to join the transition. We find a track that takes the direction of the road to the exit of this section. At the end of several kms where we run to the maximum, the track stops and we fear the worst... Romu who gets better to stall on this ugly card and find a pass. He saves us and 1 good hour later we end up reaching finally this road! Still running fast until t3 Tom is a little tired. But less than the friends d agde who end up letting us go. We arrive at the transition. We wonder how long we have been able to lose in relation to the teams who have found the pass full south... we announce 1 ers, that's good!!!!! We will learn later that we have put more 4 pm to the other teams on this section. Amazing! If we didn't solve the riddle, we bypassed it and by chance it turned out to be the "best choice"
A very long climb to start this construction site. Tom has not found his quads and the immense sandrine béranger helps him to cross this obstacle. The Himalayas chain in the background on this little morning is wonderfully bewitching. Romu Oriente and we attack, we relaunch. The long descent allows tom to regain strength. We walk on small roads and then small valley in small valley. The landscapes are very charming, the cleaner villages, we discover our first public bins sign of first changes in India. At 2/3 in the section we leave roads and slopes for a beautiful babywearing in the snow in a narrow vallon. Finally dare to tell us . babywearing is not obvious but not too long. We're going out to a collar where we find a track. The Card is completely fake. Indians always met adorable sometimes help us to choose a track rather than another. We end up getting flunk and finishing this section by 30 km of downhill always deep and in. Contrary to all the predictions, we arrive at 14 pm and stéphan just arrived with the bad bags. We don't have our tent and everything we had planned for the bivouac on the river in case. So much not to wait because it is possible with the time we still have to pass the last fast as indicated in the road book before 18 pm. We will be at 15 pm with our guide on the sutlej river. This last one doesn't speak English and doesn't seem to understand what he's doing there... we are committed very quickly in a beautiful canyon. On the other hand, Small Rapids alternate with a long dish where our long raft 10 people weighs a ton. We'll know later but the water level is low and the next morning at 9 pm the teams will benefit from a drop of water allowing them to go almost 2 times faster than us... we're moving forward Little by little and we reach the fast insurmountable. Our guide stops on the wrong side and doesn't seem to know the river. We go through and we go back very painfully the raft on the close road. This is a test of strength this babywearing. We have to put it on our 5 Heads, our cervical are suffering. After 30 minutes of hard work, we take back the river where we observe monkeys and beautiful birds. The minutes pass next, we ask our guide where is the last fast, he nodding from the head like do the Indians when they don't know!!!! Romu comes out the card and try to stall. At 18 pm, we think we have passed the last quick we ask for confirmation to our guide that will be back from the head again. We continue to say that we managed the feat that escaped us on the last rif. But no new rapids are coming and we realize that we are missing a nothing like 30 minutes. We ask the guide to stop but he doesn't want to. We insist and find a beautiful beach of sand to spend the night! Our guide is to say naked. In Short Wet Tee-shirt and without anything to eat. We do very quickly a fire with the little wood we find. We eat and we slide in our down and bivy bag for a long night of 10 pm, a luxury!!!! It's still unusual and pleasant this place. Little fire by the river on sand end white. Well we're still cold but it's nothing in comparison to the Calvary that our guide lives. We have mercy on him and we end up getting undress and giving him a jacket and a bivy bag. Wild Peacocks with their piercing screams regularly wake us up. The Charm, the magic of the raid adventure! At 6 pm we will close to finish this section. No more water. We reach the cp18 at 7 in the morning. Following 2 endless hours of dish where we will have the opportunity with romu to exchange intensely on the best placement in a huge raft on the dish  have to take care of it no! Another well-mastered transition. We apply to the tracing of the card. I will post the route that seems ideal to me and we leave very quickly. The first part is rolling and we're in race mode! We are homogeneous in the whole and our speed very fast. We're back on the bridge of the cp18 at the moment agde gets away. We estimate at 3 pm our advance. We buy a few sweet drinks in 1 minutes in a shop before attacking the wild part. A Canyon to go back in a first time. Romu as usual excels in the technical parts. He finds us the right track quickly. We are evolving very quickly in chaos, passing from the left bank to the right bank. Then we leave the canyon to go back on a road of CP 21. It is not in place and we lose 20 minutes to look for it. And then the adventure again, a long wild ascent of 1500 M of elevation in a canyon cashed with multiple tributaries. A trail appears and disappears. The rain starts to fall. We meet great white monkeys with black faces and a man alone agar in rags in the middle of nowhere... we move fast always in great shape every 4. Around 2500 m altitude we decide to leave the canyon for Attack full south slope towards the ridge leading to the temple theatre of the cp22. we move between snow plate and cliff and pretty quickly we reach this ridge and we see the trail leading to the temple of the other side. Cries of joy, we're banging in the hands. Around 16 pm we reach the top of this raid, the shali temple located at 2900 m altitude. It's snowing, we're cold and we're not hanging out. We commit the day descent and we make the initial choice to join a valley or a small road will allow us to join as soon as possible the transition. We're warming up as we go. The Indians are always so charming. We reach our little road and we take back our good rhythm alternating walking and running. The night falls and my route route prevents me from seeing that I have to leave the road for a trail! We lose about thirty minutes. Too bad because otherwise it was the perfect section. The one that every team dreams of one day on a great trek. The 4 that are progressing at the same allure, a fine and judicious orientation in fantastic landscapes! We find the smell, one last climb to join the main road and again 3,5 km to join the transition around 21 pm. What section! Let's go back, sleep has left us! The suite is still monotonous but the sunrise allows us to appreciate the grandiose setting that surrounds us. Again the channel of the Himalayas in the distance for an unforgettable sunrise. We are approaching the koti resort near shimla, beautiful city of the region. At 6 pm we will close the finish line very neat by the organization team. A beautiful arrival at sunrise with a lot of people for an hour so morning. We are happy, proud of this very successful race. Physically we were very strong and homogeneous. We have been able to tame Indian Cards and we discovered a multi-faceted country full of surprise and culturally so far away from ours. Romy, Tom and myself were at the top of our shape and sandrine confirmed that currently she was unique at this level... here is our 5th world cup in the pocket after the raid in France 2010-2014-2015 and the Spain 2017. A huge bravo also to our friends Sonia, polo, Niko and Anthony who finish in the second place of this great raid. We shared before during and after the race of such good times. Congratulations also to issy who finishes 5th, the neighbors of Vaucluse 8TH AND ADÉORUN 11th. France of the raid that confirms its rise in power supported by the Federation French Triathlon. See you soon for new adventures because this one was at note taste a hair too short! It's a long report but be sure to read about their adventure on the final bike to the finish - yikes!! Any idea what "babywearing" means? Oh! Google Translate says “portage”. Huh.